Purpose: Interprofessional education (IPE) is a means of fostering integration and collaboration between health care professions. The purpose of this study was to evaluate the effect of an IPE educational module on dental hygiene (DH) and physician assistants (PA) students' knowledge of the oral manifestations of menopause and overall confidence in treating these conditions. Methods: A convenience sample of DH and PA students was used for this mixed-method study. Quantitative data was collected with pre- and post-tests using a modified Readiness for Interprofessional Learning Survey (RIPLS) and a principle investigator (PI)-designed knowledge of menopause test, to determine the students' attitudes and learning levels. Students participated in a one-time workshop that included an educational presentation on the oral manifestations of menopause and a case study exercise using a pseudo-standardized patient. Students from both disciplines, worked in preselected groups to create a patient care plan addressing the oral manifestations of menopause. Qualitative data was collected from student comments. Results: Study results indicate an increase in participants' knowledge of the oral manifestations of menopause (p<0.05). Results also suggest improved attitudes toward interprofessional teamwork and collaboration (p<0.05), positive professional identity (p<0.05), roles and responsibilities (p<0.05) for IPEC core competencies RR1, RR2, RR3, RR4, interprofessional communication (p<0.05) for IPEC core competencies CC3, CC4, CC 6. Qualitative data from interprofessional care plan formulation and debriefing demonstrated facilitation of gained confidence in applying new skills related to the oral manifestations of menopause. Conclusion: Patients experiencing menopause are susceptible to oral manifestations. Implementation of an IPE intervention demonstrated correlation between an IPE experience and participants' knowledge, attitudes and confidence. Preparing students to meet the needs of menopausal women may ultimately decrease oral discomfort and improve overall quality of life. Teaching methodologies in health care training programs incorporating the use of actors trained to portray patients in a simulated clinical setting, (standardized patients or SP), and case studies allowing for new learning to be applied to real-life scenarios following completion of a related lecture or lab, (case-based learning or CBL), have been shown to improve students' confidence within a non-threatening environment.25,26 The use of SP and CBL has been shown to improve students' communication, interviewing, and clinical skills.25,27,28 Research indicates that CBL is commonly used in both DH and PA curricula.29-31 Calhoun, et al., reported that the majority of accredited PA programs use SP as a teaching methodology.32 However, little evidence is found regarding use of SPs in DH education and when reported its use has been limited to tobacco dependence counseling training.26,33 There is a lack of research available regarding use of SPs and CBL in menopause/oral health education across the health care disciplines. The purpose of this study was to evaluate the effect of an IPE educational module on dental hygiene (DH) and physician assistants (PA) students' knowledge of the oral manifestations of menopause, interprofessional collaboration and overall confidence in treating these oral conditions. A mixed-method pre- and post-test design evaluated the comparative relationship between DH and PA students related to an educational intervention. Subsequent to Eastern Washington University IRB approval, a convenience sample of DH students from Eastern Washington University (N= 63) and PA students from the University of Washington MEDEX Northwest PA program (N=29), were invited to participate in the study. Inclusion criteria were current enrollment in the DH or PA program and matriculation in the respective program to the point of having had clinical exposure to patients. DH and PA students were invited to attend separate informational meetings regarding the study. Students who completed a consent form (N=54), were emailed a link to enroll in the study workshop session. The principle investigator (PI) reserved a classroom at the study site equipped with a dental chair and audio-visual equipment for the workshop. All printed forms, tests and supplies were provided to the participants by the PI. The three-hour workshop began with a demographic survey, menopause knowledge pretest, and a modified Readiness for Interprofessional Learning Survey (RIPLS)35,36 pretest. Upon completion of the baseline assessments, participants listened to a presentation regarding IPE followed by information on the oral manifestations of menopause. Participants were then randomly assigned to one of six heterogeneous interprofessional (IP) teams to create a patient care plan based on a given case study and pseudo-SP presentation. Participants were provided guidelines for management of the oral manifestations of menopause (Figure 1) and the IPE Assessment, Diagnosis, Planning, Implementation, Evaluation, and Documentation (A.D.P.I.E.D.) Process of Care Algorithm (Figure 2), both designed by the PI. All participants received the same educational slide presentation and case study. The same pseudo-SP was used throughout the workshop. Upon completion of the workshop, participants were given a menopause knowledge post-test, modified RIPLS posttest, and participated in a videotaped debriefing interview. The workshop utilized a single case study addressing xerostomia, periodontitis, and oral osteoporosis. The case study format and use of pseudo-SP encouraged participants to assess a multitude of factors, provide patient education and counseling, and develop a collaborative care plan as a team. Each IP team recorded findings, diagnosis, and treatment on a patient care plan worksheet used to collect qualitative data. The case study content was based on information from the literature review and represented a complex menopausal patient scenario requiring expertise from both DH and PA professionals for assessment, appropriate intervention and best outcomes. Instruments used in the current study included a demographic survey, modified RIPLS survey menopause knowledge pre- and post-test, patient care plan worksheet, and videotaped debriefing session. The demographic survey provided descriptive statistics of the sample regarding age, gender, race, professional discipline, years of clinical experience, and prior experiences. A multiple-choice pre- and post-test evaluated for changes in knowledge regarding oral manifestations of menopause and the oral systemic health connection. The knowledge test subsections included women's health and IPE, menopause systemic manifestations, oral manifestations, and oral health management in menopause. Data was also collected via video recording of the participant's debriefing. The PI transcribed the videos to analyze for themes, measure participants' confidence in IP patient care regarding oral manifestations of menopause, likeliness to use knowledge gained from the current study in the future, and feelings about the use of pseudo-SP and CBL. Data was analyzed using SPSS® statistical software (version 23). The purpose of this questionnaire is to examine the attitude of health care students toward interprofessional learning. The Wilcoxon signed-rank test analyzed pre- and posttest modified RIPLS scores to test the second hypothesis, “Can an IPE module on oral manifestations of menopause improve DH and PA student's attitudes and perceptions about IPE? Table III shows significant changes in perceptions of IPE were indicated in two of the four RIPLS subscales, teamwork and collaboration (p<0.05) and positive professional identity (p<0.05). The participants demonstrated improved perceptions regarding IPEC domains, RR (p<0.05 RR1, RR2, RR3, RR4) and CC (p<0.05 CC3, CC4, CC6) as shown in Table IV. 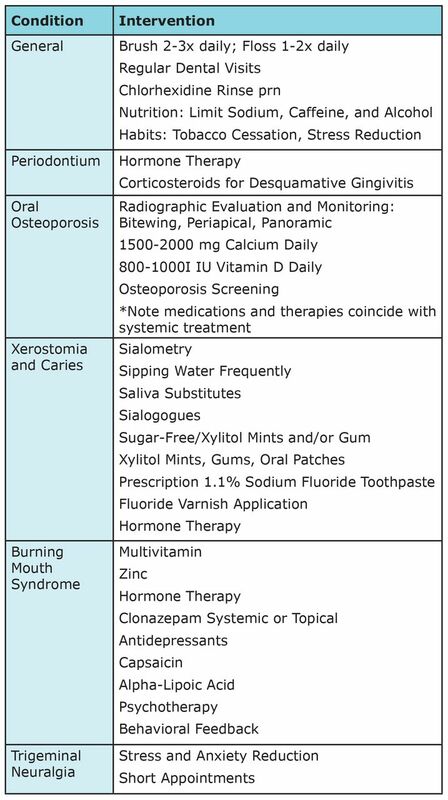 Oral Diagnoses: xerostomia, oral osteoporosis, and periodontitis. Risk Factors for oral manifestations: menopause, nutrition, alcohol, smoking, caffeine, salt, stress, lack of sleep, infrequent dental/medical visits, and poor homecare. Barriers to care: low medical/dental IQ, finances, and environmental factors. 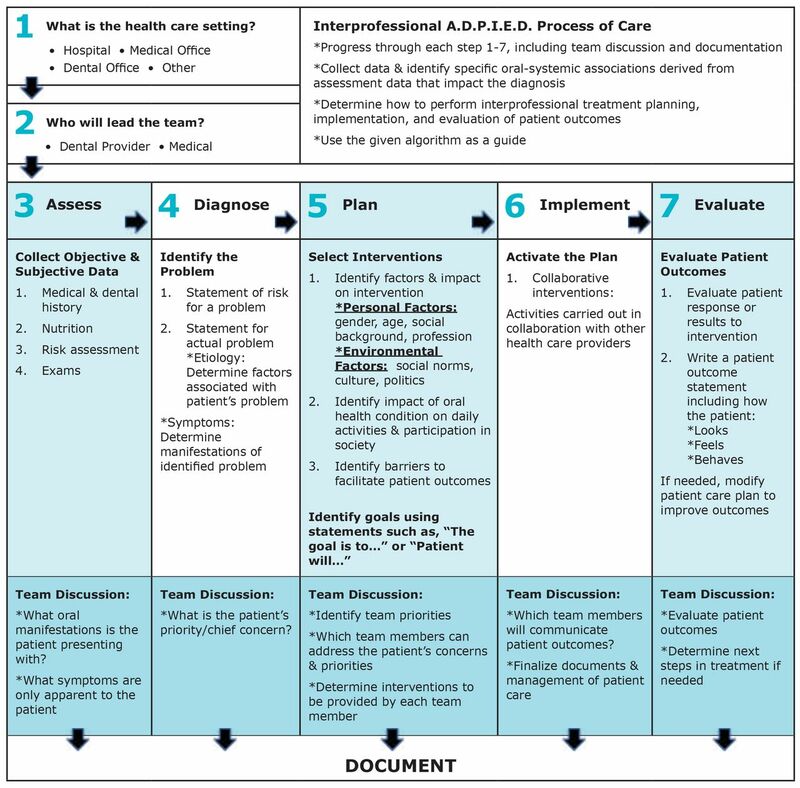 Table V indicates all teams were able to successfully create an IP care plan using the case study information, PI-designed guidelines for management of the oral manifestations of menopause, and PI-designed IP A.D.P.I.E.D. Process of Care Algorithm. Table VI shows coded debriefing data indicating gained confidence in treatment of the oral manifestations of menopause. This study explored the effects of an intervention consisting of a presentation and pseudo-SP case study on the oral manifestations of menopause. Results of the study suggest that the implementation of an IPE workshop for DH and PA students on oral manifestations of menopause imparts new knowledge, gives parti-cipants the opportunity to communicate in small groups and improve attitudes and perceptions toward IPE, and facilitates gained confi-dence of participants in applying new skills related to the oral manifestations of menopause. Prior to participating in this study, the majority of participants demonstrated lack of awareness in the oral health manifestations and oral health management during menopause, as measured by the menopause knowledge pre-test. These findings were surprising given 84% of DH (n=21) and 38% of PA (n=3) in the current study reported experience in treating oral conditions in general. Previous research suggests lack of specific training in oral health inhibits PAs from providing oral care services.6,7,45-47 Research conducted by Murray and Fried indicates that DHs also need more training regarding the oral manifestations of menopause.48 Therefore, it may be inferred that if PA are not trained to provide oral care services and DH are not trained to recognize and manage the oral manifestations of menopause, they may omit discussions about the oral manifestations of meno-pause when providing patient care. Results from this study support previous research indicating that oral health providers, including DHs, possess greater pot-ential for the detection, monitoring, and prevention of chronic conditions49 which in turn supports the impor-tance of integrating women's health content into the DH curriculum. Communicating in small IP groups facilitated improved attitudes and perceptions toward IPE through learning about each other's roles and responsibilities. Utilizing the PI-designed IP A.D.P.I.E.D. Process of Care Algorithm and guidelines for management of oral manifestations of menopause, DH and PA students collaborated in teams to create a patient care plan and provide patient-centered care with a focus on assessing and treating oral manifestations of menopause.36,38 The modified RIPLS evaluated students' attitudes and perceptions regarding IPE.50-52 Measured aspects of students' attitudes and perceptions toward IPE showed significant improvement in IP teamwork and collaboration and positive professional identity. Overall, there were no significant changes in negative professional identity or RR domains. However, item number 17 in the RR domain was shown to be statistically significant. Although no IPE curricula currently exists between DH and PA programs, this study validates that improvements in IP communication and understanding of roles and responsibilities may enhance opportunities for collaborative practice.10 Debriefing data demonstrated that this workshop permeated some of the silos separating medicine and dentistry, providing hope that a new generation of practitioners will develop professional identities and categorizations that deconstruct traditional roles. There were limitations to this study that should be noted. Data was collected from a one-time study of a small sample, thus limiting any broad generalizations. Due to the volunteer nature of the study and the IPE credit received for attending, participants may have been extrinsically motivated to participate in IPE. The effectiveness of the group work may also have been limited by student fatigue, a lack of knowledge regarding their respective examination standards and scope of practice as well as discomfort discussing certain women's health issues such as vaginal dryness. It should also be noted there was an unequal distribution of students representing the DH and PA professions in each team which may not have authentically represented the IP team dynamic in a real clinical setting. Team members also had varying levels of didactic and clinical experience. Long-term studies are recommended to determine if the knowledge and skills gained from a one-time intervention regarding oral manifestations of menopause occurring as part of the education process, translates to incorporation into clinical practice. Future research is also recommended to identify evidence based oral care guidelines for menopause and to continue to evaluate the PI-designed, IP IPE A.D.P.I.E.D. Process of Care Algorithm. Future studies should include a larger more diverse group of students, and include other healthcare professions. It is also recommended that the variations in knowledge during the DH education process be evaluated to determine the ideal point for introducing IPE in the curriculum. Patients experiencing meno-pause are susceptible to oral manifestations. Implementation of an IPE intervention demonstrated a correlation between an IPE experience and participants' knowledge, attitudes and confidence. Utilization of a process of care algorithm and guidelines for management of the oral manifestations of menopause promoted IP collaboration and comprehensive oral care management for the menopausal patient. Preparing students to meet the needs of menopausal women may ultimately decrease oral discomfort and improve overall quality of life. Additional IPE experiences, allowing DH and other health care disciplines to learn about, from and with each other has the potential to improve knowledge, perceptions, and confidence in patient care. Windy L Rothmund, RDH, MSDH is a member of the dental hygiene faculty; Ann D O'Kelley-Wetmore, RDH, MSDH is an associate professor and department chair; Merri Jones, RDH, MSDH is an assistant professor; all in the Department of Dental Hygiene, Eastern Washington University, Spokane, WA. Michael B Smith, DHEd, MPAS, PA-C is a lecturer and site director for the MedEx Northwest PA Program, University of Washington, Department of Family Medicine, Spokane, WA.
. Interdisciplinary collaboration for health care professionals. Nurs Adm Q. 2008 Feb-Mar; 32(1):40-48.
. Team-based competencies: building a shared foundation for education and clinical practice. Washington, DC. IPEC. 2011.
. A literature review: overview of international and Australian developments in interprofessional health education (IPE). Sydney, Australia. Centre for Research in Learning and Change, University of Technology. 2011.
. Continuing interprofessional education: collaborative learning for collaborative practice. In: Wentz DK, ed. Continuing medical education: Looking back, planning ahead. Hanover, NH. Dartmouth College Press. 2011.
. Framework for action on interprofessional education and collaborative practice. Geneva. World Health Organization. 2010.
. Advancing oral health in America. Washington, DC. National Academies Press. 2011.
. Improving access to oral health care for vulnerable and underserved populations. Washington, DC. National Academies Press. 2011.
. Measuring the impact of interprofessional education (IPE) on collaborative practice and patient outcomes. Washington, DC. National Academies Press. 2015.
. Interprofessional education: The inclusion of dental hygiene in health care within the United States-a call to action. Adv Med Educ Pract. 2013 Oct 30;4:227.
. Using an expanded oral health curriculum by practicing physician assistants. J Physician Assist Educ. 2013 Sep;24(3): 23.
. Interprofessional education in U.S. dental hygiene programs: a national survey. J Dent Educ. 2015 Nov 1;79(11):1286-1294.
. Professionalism, gender and female dominated professions:dental hygiene in Ontario. Can Rev Sociol Anthropol. 2003 Aug;40(3):267-89.
. Oral discomfort at menopause. J Oral Maxillofac Surg Med Pathol. 1989 May;67(5):535-536, 540.
. Menopause and oral health. J Midlife Health. 2014 Jul-Sep;5(3):115-120.
. Oral manifestations and dental treatment in menopause. Med Oral. 2002 Jan-Feb;7-26.
. The benefits of estrogen replacement therapy on oral health: The leisure world cohort. Arch Intern Med. 1995 Nov 27;155(21):2325-29.
. Menopause and the oral cavity. Indian J Endocrinol Metab. 2012 Jul 5;16(4):548-51.
. The menopause and oral health. Maturitas. 2009 Mar 25;63(1):56-62.
. How menopause affects oral health and what we can do about it. Cleve Clin J Med. 2009 Aug;76(8):467-75.
. The North American Menopause Society recommendations for clinical care of midlife women. Menopause. 2014 Oct;21(10):1-25.
. Oral manifestations of menopause. J Basic Clin Reprod Sci. 2015 Jan-June;4(1).
. Teaching strategies promoting active learning in health care education. J Educ Hum Dev. 2007 Dec;1(1).
. Tobacco cessation treatment education for dental students using standardized patients. J Dent Educ. 2014 Jun;78(6):895.
. Reliability of standardized patients used in a communication study on international nurses in the United States of America. Nurs Health Sci. 2012 Feb 9;14(1):67-73.
. Teaching medical students about disability: the use of standardized patients. Acad Med. 2011 Sep;86(9):1163-1170.
. Developing and pretesting case studies in dental and dental hygiene education: using the diffusion of innovations model. J Dent Educ. 2012 May;76(5):590-601.
. Cases in clinical medicine. Sudsbury, MA: Jones and Bartlett Learning; 2012. 484 p.
. Use of case-based learning in dental hygiene curricula. J Dent Educ. 1998 Mar;62(3):257-259.
. The use of standardized patients in the training and evaluation of physician assistant students. J Physician Assist Educ. 2008 Jan;19(1):18-23.
. A randomized controlled trial of the effect of standardized patient scenarios on dental hygiene students' confidence in providing tobacco dependence counseling. J Dent Hyg. 2012 Fall;86(4):282.
. Standardized patient instructors' and physician assistant students' evaluation of diabetes counseling skills. J Physician Assist Educ. 2013;24(4):9-14.
. The readiness for interprofessional learning scale: a possible more stable sub-scale model for the original version of RIPLS. J Interprof Care. 2005 Dec;19(6):595-603.
. The test-retest reliability of a revised version of the readiness for interprofessional learning scale RIPLS. J Interprof Care. 2006 Dec;20(6):633-639.
. 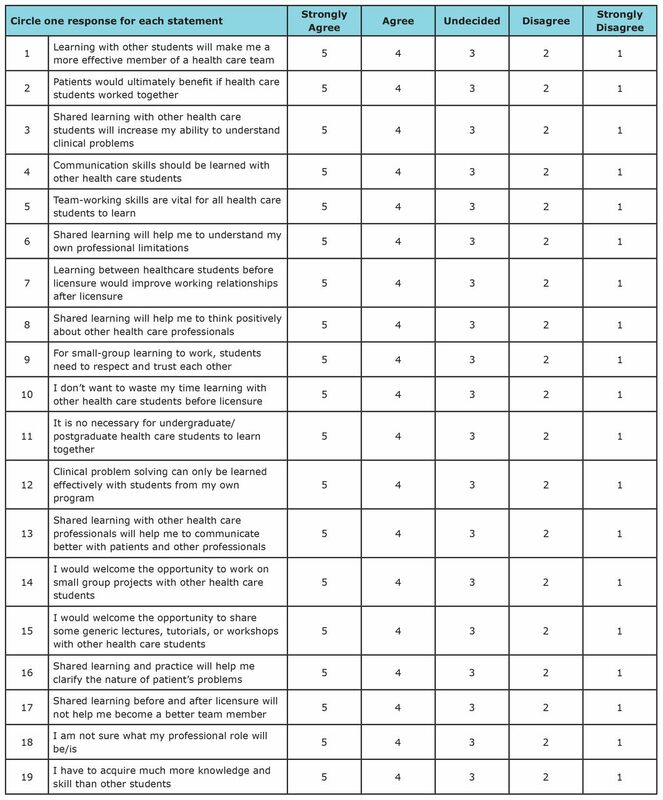 The development of a questionnaire to assess the readiness of health care students for interprofessional learning (RIPLS). Med Educ. 1999 Feb;33(2):95-100.
. Interprofessional team reasoning framework as a tool for case study analysis with health professions students: A randomized study. J Res Interprof Pract Educ. 2012 Aug;2(3):250-263.
. Interprofessional education on oral care for cancer patients in dental hygiene and nursing [thesis]. [Cheney]: Eastern Washington University; 2014. 261p.
. Training and utilization of oral health knowledge and skills for physician assistant students. Poster presented at: Physician Assistant Education Association Annual Education Forum; 2012 Nov 6-7; Seattle, Washington.
. Advancing oral health in physician assistant education: Evaluation of an innovative interprofessional oral health curriculum. J Physician Assist Educ. 2013 Sep;24(3):27.
. Teaching oral health to physician assistant students through interprofessional learning. J Dent Educ. 2015 Feb 1;79(2):179.
. Oral health curricula in physician assistant programs: A survey of physician assistant program directors. J Physician Assist Educ. 2010 Jun;21(2):22.
. The role of the pediatrician in the oral health of children: a national survey. Pediatrics. 2000 Dec;106(6):E84.
. Dental hygienists' knowledge of menopause and its potential oral manifestations. J Dent Hyg. 1999 Winter;73:22-28.
. The effect of chairside chronic disease screenings by oral health professionals on health care costs. Am J Public Health. 2014 Feb 13;104(4):744.
. Attitudes toward interprofessional education: comparing physician assistant and other health care professions students. J Physician Assist Educ. 2012 June;23(2):8.
. Knowledge and attitude change in physician assistant students after an inter professional geriatric care experience: a mixed methods study. J Physician Assist Educ. 2014 Jul 24;25(2):25-30.
. Evaluating interprofessional learning modules: health students' attitudes to interprofessional practice. J Interprof Care. 2013 May 14;27(5):424-425.
. Dental hygiene students' application of knowledge of women's health issues. J Dent Hyg. 2010 Jan 1;84(1):49.
. Using standardized patients to educate medical students about organ donation. Commun Educ. 2010 Mar;59(3):249-262.
. Nursing students' experiences with and strategic approaches to case-based instruction: a replication and comparison study between two disciplines. J Nurs Educ. 2002 Apr;41(4):165-174.
. Physical therapist students' perceptions of and strategic approaches to case-based instruction: suggestions for curriculum design. J Phys Ther Educ. 1998 Feb;12(2):33-42.
. Dental hygienists in multidisciplinary health care. Probe. 1999 May-Jun;3(11):14.
. A qualitative study of tobacco dependence treatment in 19 US dental hygiene programs. Prev Chronic Dis. 2012 Nov;9:E160.
. Transforming dental hygiene education, proud past, unlimited future: Proceedings of a symposium. Rockville, MD: HRSA. 2014.
. Chronic disease screening in oral health care delivery settings: achieving the triple aim. Access. 2015 Jul;29(6):14-15.
. How menopause affects oral health, and what we can do about it. Cleveland Clin J Med. 2009 Aug;76(8):467–75.
. Oral health and menopause: a comprehensive review on current knowledge and associated dental management. Ann Med Health Sci Res. 2013 Jul-Sep;3:320-323.
. Menopause: changes in the mouth cavity and preventive strategies. J Women's Health Care. 2012 Feb;1:1.
. The physiology, medical management and oral implications of menopause. J Am Dent Assoc. 2002 Jan;133:73–81.
. Burket's Oral Medicine. 11th ed. Hamilton: BC Decker Inc; 2008.
. Crosstalk between hormones and oral health in the mid-life of women: a comprehensive review. J Int Soc Prev Community Dent. 2014 Nov; 4(Suppl 1): S5-S10.
. Dental considerations in pregnancy and menopause. J Clin Exp Dent. 2011 May;3(2):e135–44.
. Oral manifestations and dental treatment in menopause. Med Oral. 2002 Jan-Feb;7(1):31–5.
. Burning mouth syndrome: a review and update. J Oral Path Med. 2013 Oct; 42(9): 649-655.